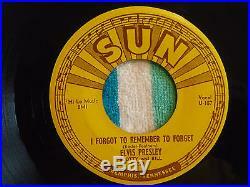 ELVIS PRESLEY, SCOTTY & BILL - MYSTERY TRAIN / I FORGOT TO REMEMBER TO FORGET - 45 RPM SINGLE - SUN #223 - 1955. Original American 7 single release on Sun with yellow and brown labels. Original pressing of Elvis Presley's fifth single from 1955. Side 1: 45-U-156X 20 5498 (the "20" is slightly higher than the other numbers). Side 2: 45-U-157X 20 5499 (the "20" is slightly higher than the other numbers). Vinyl: VG/VG+ (a few visible superficial hairlines and sleeve marks--nothing deep or directly audible) Labels: VG+/NM. OUR VINYL GRADING SYSTEM: (record & cover are graded separately in each listing). Never opened, still sealed, presumed mint vinyl. The highest grading used for an opened record. Practically mint, no major flaws if any flaws at all. VG+/NM (VERY GOOD PLUS TO NEAR MINT)... Better than VG+ but not quite NM. A great looking record with perhaps a few small imperfections such as a light scratch or two. VG-/VG (VERY GOOD MINUS TO VERY GOOD)... Better than VG- but not quite VG. A fairly abused record that still plays without skips, a lot of surface noise and several imperfections. Cover will have several splits, light water damage, several creases, damaged corners, large areas of graffiti, or spine is peeling in areas. G/VG- (GOOD TO VERY GOOD MINUS)... Better than G but not quite VG. Pretty much a filler copy, scratched to hell, may have skips, lots of background noise, maybe a little warped. Cover is damaged beyond belief. We are Kohl Kurios, two brothers: Jayson and Scott Kohl. Please check out our ever-growing store! 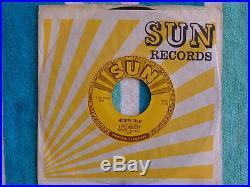 The item "ELVIS PRESLEY Mystery Train 45 rpm SUN #223 1955 ORIGINAL ROCKABILLY" is in sale since Friday, October 21, 2016. This item is in the category "Music\Records". The seller is "kohlkurios1" and is located in Eliot, Maine.